Every color of sapphire possesses its own unique beauty. Those with an intense color are especially valuable. Sapphire and ruby are both the same mineral, corundum. Corundum occurs in all the colors of the rainbow - red, orange, yellow, green, blue, and violet. Red corundum is called "ruby," while blue is referred to as "sapphire." All other corundums are designated by their color name followed by the word "sapphire," and are collectively called "fancy-colored" sapphires. The gemstones as shown in the photograph on the next page. are exceptional yellow, violet, and orange sapphires. Regardless of what color names are applied, some fancy-colored sapphires can have truly beautiful colors. Though few in number, there are fancy-colored sapphires with eye-opening colors such as strongly reddish orange or bright “lemon” yellow. One can only admire the unique beauty of each of these gemstones, some of which command more than $100,000 for a 10- to 20-carat stone. Pinkish-orange sapphires may sometimes be called "padparadscha" sapphires, a name derived from Sanskrit words referring to the color of a lotus flower. 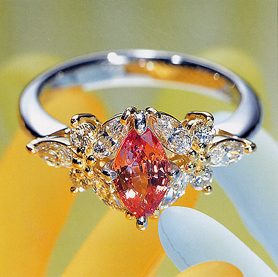 The main stone in the ring pictured below is a heated sapphire with what can be called a beautiful padparadscha color. Identification reports issued by the laboratory at the Gemological Institute of America (GIA) do not specify the classification "padparadscha," because the judgment of this color involves subjective factors such as cultural usage and personal preference. Many of these sapphires are heated to enhance their color. The color of some untreated padparadscha sapphires will fade over time. However, an untreated padparadscha sapphire that has faded will return to its original orange color if exposed to sunlight for about an hour. When choosing fancy-colored sapphires, it is important to look at the stone for yourself and select one you find truly beautiful, concentrating on quality without being influenced by names.